This is a dessert that never fails to impress. It is incredibly easy, but requires you to learn a new skill – making caramel. Pressure cook this flan in 10 minutes and the transformation to semi-solid goodness is complete! You will also need a “trivet” or something to keep the forms from touching the bottom of the pan. A trivet did not come with my pressure cooker, so I use a collapsible steamer basket. However, you could also try one of your real trivets, if it fits in your pressure cooker pan. You can vary the flavor of this pudding by substituting the vanilla infusion of the milk with saffron, cinnamon, cardamom, or even lemon, mandarin or orange zest! In your widest sautee pan, add the sugar and turn the flame to high and wait. 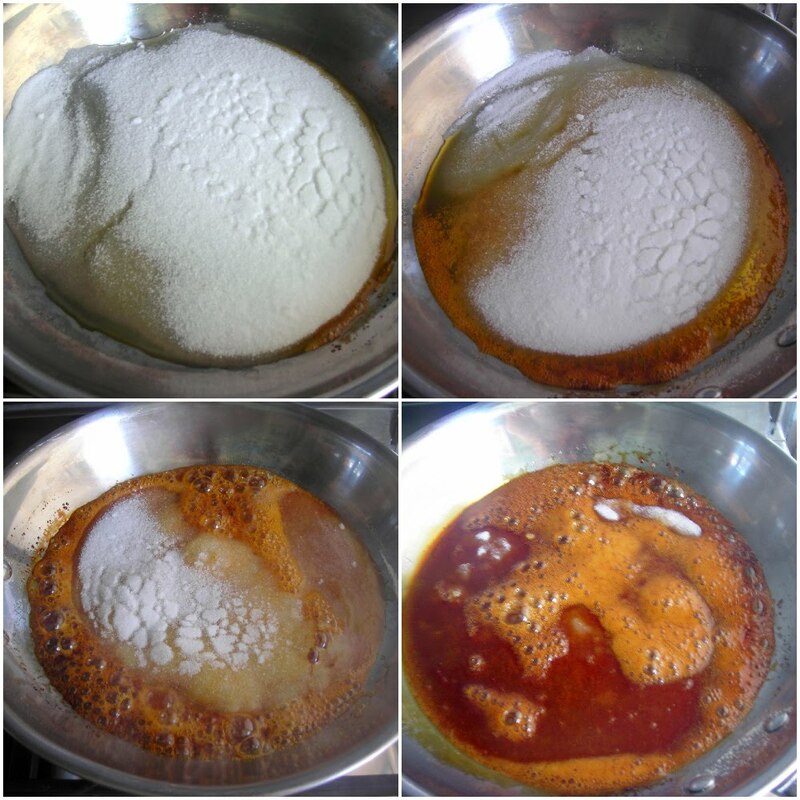 DO NOT STIR - at most, pick up the pan and swish it around to make sure the sugar is evenly melted in the caramel. As soon as almost all of the sugar has turned to caramel turn off the heat. Hold the form with your oven-mitt-covered hand, or some other protection that will not limit your dexterity yet protect your hand form the hot scalding sugar. With the other hand, pour a little caramel in the bottom and then twirl it around covering the form internally and on the sides as much as you can. I highly recommend you read David Lebovitz's How to Make the Perfect Carmel primer before caramelizing sugar for the first time. Infuse the milk with the Vanilla or Vanillin by heating the milk and vanilla to almost boiling and then turning it off (it will take about 30 minutes to cool-off and infuse). 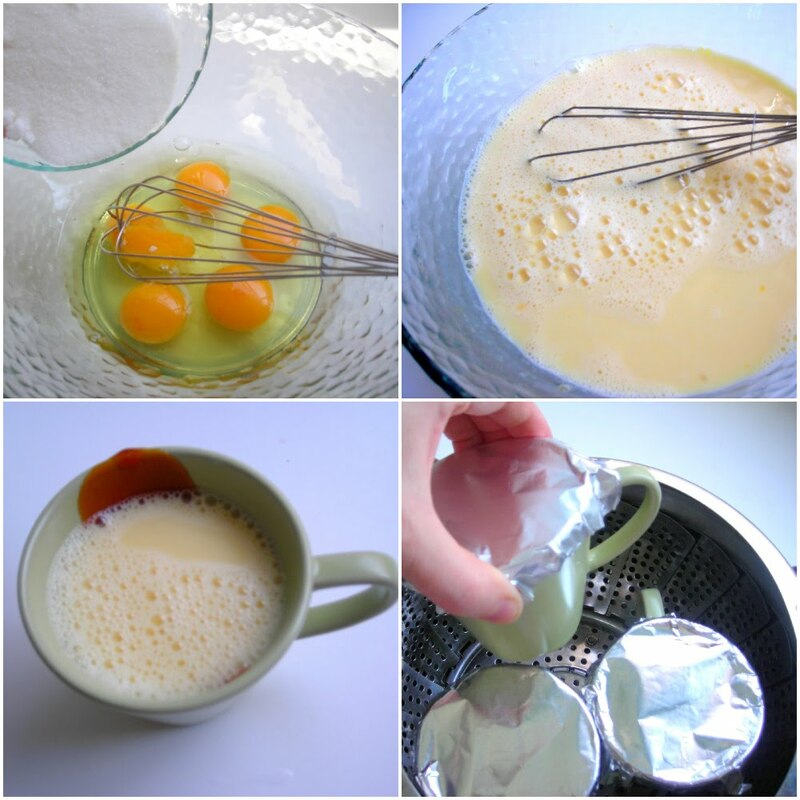 Using a fork or a whisk in 4 whole eggs plus one yolk with the sugar. Pour the cooled milk into the egg mixture. Mix well -the resulting consistency will be very liquid. Fill the caramelized containers, by pouring or using a soup ladle, leaving ½" (1 cm) space from the top. Cover the forms tightly with aluminum foil. Prepare the pressure cooker by adding two cups of water and the steamer basket. Place as many forms as possible that will stay straight - for me it's three of the big teacups or 4 of the medium glass forms, and 5 espresso cups -but they are really small so I make these for the kids! Close and lock the pressure cooker top, turn the heat to high and when it reaches pressure, turn the flame down to minimum. Count 6-8 minutes cooking time (for 6 oz glass custard cups - time may vary based on the size and thickness of the container used). When time is up, open pressure cooker and open with the Natural Release - turn off the heat and don't do anything wait for the pressure to come down naturally. If after 10 minutes all of the pressure has not released, relieve the rest of the pressure with the pressure valve. For electric pressure cookers, disengage the Keep Warm setting when cooking time is up and turn off or unplug the pressure cooker. When time is up, open the top and check for doneness by sticking a toothpick in the middle of one of the cremes. If it comes out dirty, simply place the pressure cooker cover back on and wait another 5 minutes- the residual heat from the pressure cooker will keep cooking them. If the creme caramels are still liquid, cook under pressure and additional 5 minutes. Then, let your creme caramels cool outside the pan for about an hour before refrigerating. Refrigerate for at least three hours before serving. If you need to do another batch, remember to add more water in your pressure cooker! To serve, simply turn the form upside-down onto each dessert dish. If the Creme Caramel does not come down on it's own, insert a flat knife and run it carefully along the sides. Then, on one side pull the knife a little towards the center to break the suction. Place the dessert plate on top of the form and flip it around quickly. I was searching for ways to make small flan/creme caramel for my kids in the pressure cooker. It worked out great! Thanks! Right now I am attempting it in aluminum cupcake liners placed in a cake pan to see if it will work for lunches. Today, as I promised, I made the creme caramel. You were right. It did blow my mind! It was heavenly. I used only one form, I cooked it a little longer than the time you give for the small forms and the result was perfect. Thank you one more time for your lovely recipes. Now I have your blog with my favourite ones, I will read all your older posts as well as every new post and when I cook one of your recipes I’ll inform you about the results. (Pls excuse my mistakes but english is not my native language). Great job, Stelp! Thank you for noting that with one large form the timing should be extended a little bit. I hope you have lots of help to eat all of these desserts. I look forward to your feedback, both positive and negative. Especially if something doesn’t work out, leave me a comment and send me an email so we can trouble-shoot and find out if there is a problem with the recipe or the way I described it. Creme caramel is one of my favorites. I think the secret to a silky smooth creme caramel (or cream brulee) is to strain the custard mixture a couple of times before pouring it into your mold. It makes a such a difference! Thanks for the tip Carole! Nam, thank you for the compliment. The dishes made the shot, fresh flowers randomly re-arranged by the wind made it pop! The coconut covered creme caramel “had” a flower on it, but I liked it much better once the breeze did a little editing! Looks delicious! I can’t wait to try this. Gwen, I’ll let you in on a little secret… I get my most unusual dishes at the Euro-shop (that’s like a Dollar Store). Shhhh! Most of them are parts of “appetizer” sets, sold individually! I checked under the dish for you but there is nothing written – likely all of the information was on the bar-code sticker that I peeled away after I bought them. Happy Hunting! You can always cook more, never less! dessert looks wonderful….absolutely delicious…there’s an award galore waiting for you in my space…plz accept it ! Wow, thank you for the blog award, fishrecipes! This has to be one of my favs but I’ve never made them in a pressure cooker. This needs to be remedied! Love all your lovely photos and step-by-step. Welcome Jill, and congratulations on your new book! A chef in Italy has made macarons in the pressure cooker – he calls it a “soft macaron” but I cannot bring myself to make one – if it’s not crunchy on the outside… I don’t think it really qualifies! Hi just wanted to say that your Crème caramel just pops out of the page! What a creative photo. I was just craving something sweet too! Welcome veena! What a great discovery your blog is… too. I will be reading the archives to learn more about all kinds of spices!!! Great photo really nice presentation! Just love the look of these desserts! This is something I’d have never thought of doing in a pressure cooker. It looks fabulous! Is it boiling milk for 30 mins with vanilla or boiling it and then letting it cool for 30 mins? You bring the milk to an almost-boil with the vanilla and let it cool for about 30 minutes – if it’s too hot it will cook the eggs when you mix-in the milk. 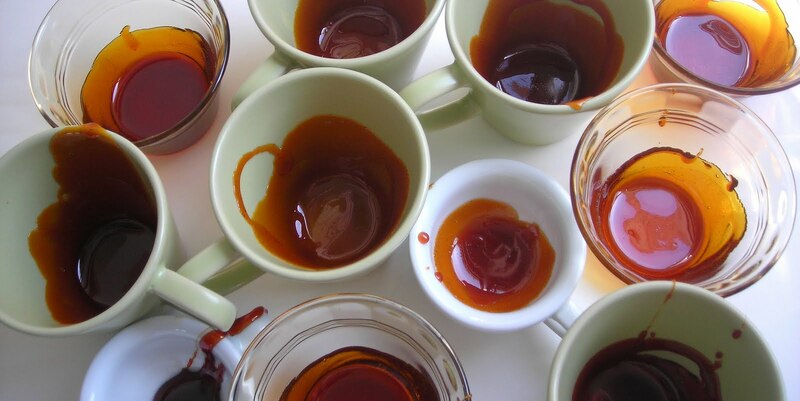 I brought the caramel to the limit of reasonable cooked-ness and started pouring it into my cups… but I took a long time to do that and the caramel kept right on cooking feverishly in the bloody hot pan. Ergo, burning unpleasantly. So addendum to step 4 in section 1: work fast. Otherwise it was very decadent. I only had 2% and whipping cream… so I used the 35% fat milk because it is dessert after all. Can’t wait to try the creme Brule recipe next!